How to make a coat rack for wall and picture gallery in one? Add a touch of whimsy to a hallway or vestibule with this versatile DIY coat rack that is also a photograph or picture gallery. Here’s a way to clear up clutter in the hall and ensure that everyone in the household knows where their coats, scarves, hats, and umbrellas are located. This wall mounted coat rack not only does this provide extra storage space for the family’s gear, but also a place for all those extra photographs and pictures squirreled away in drawers and cupboards. In this project, small wooden frames are used to hold a collection of pressed ferns and leaves mounted on copies of old letters but family photos or other favorite pictures or photographs can be used instead. Why not put a photograph of each family member (including the family pet) above each hook so that everyone has their own personal place for their coats, scarves, and leashes? A great way to keep everyone organized. Or use scenes of the family at the cottage or at the beach to brighten up those long winter days ahead? Only rudimentary carpentry skills are required as this coat rack is a simple project and only requires the use of an electric screwdriver. Kids can help out by choosing and helping put the photographs or pictures together. Don’t be shy about wandering around your local lumberyard to pick up a nice piece of pine board for just a couple of bucks. Attractive hooks can be purchased at lumber yards or hardware stores as well. The coat rack described below measures 1-foot by 5-feet. It can be made shorter but the number of hooks and frames will need to be adjusted. Sand the pine board all over to remove any rough edges. Brush off any sawdust with a tacking cloth. Varnish the board with a coat of varnish, stain or paint, following container instructions. Repeat, if necessary when dry. Set aside. If not already framed, put each photo into the frames. To attach each framed picture, drill four holes at each of the corners of the frames. Determine placement of the framed photos on the board. Mark the position of each frame on the board lightly with a pencil. To determine the placement of the hooks beneath the frames, mark the position of each one with the pencil and then screw each into place. Note: Use the center of the bottom of the frame and ensure the hook is at least two inches below that. Mount the completed coat rack to a hallway or vestibule wall with the two wall-mounting screws. 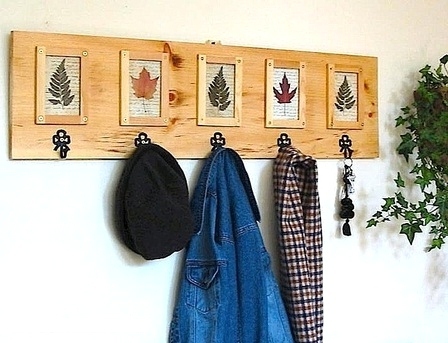 Not only will this coat rack keep everything in its place, but includes an added bonus: the pictures can easily be removed and replaced with the changing seasons or décor!